This strand will examine how jazz has developed in each partner country and how�the music relates to arts policies, cultural infrastructure and education. How do different versions or interpretations of jazz history compete and underpin opposing ideological evaluations? 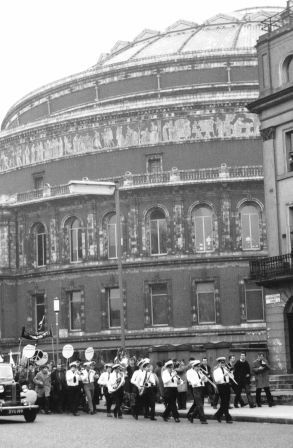 Omega Brass Band passing The Royal Albert Hall c. 1960 on a CND Aldermaston march. Used by permission of the Ken Colyer Trust. Building on these observations, the development of jazz cultures in Europe, and similarities and differences between national scenes, have never been studied in a comprehensive way.� This strand addresses the need for a complex and multifaceted study of jazz cultures, examining how the concepts of cultural canonicity, history and ideology change in different European contexts and analysing the wider inferences that can be drawn from this.